Soil organic carbon is not only an important source or sink of CO2 but also important for soil fertility. Before the invention of mineral fertilizers, management of organic carbon was the only way to restore or maintain soil fertility. Sedentary farmers either depleted their carbon stocks for nutrients, facing nutrient depletion, or found ways to maintain soil organic carbon. Migration is the solution to nutrient depletion for an estimated 300 to 500 million people affecting al-most one third of the planet’s 1500 million ha of arable land (9, 10). This agricultural system is termed “shifting cultivation”, indicating moving from one spot to another as soil fertility declines. Decreasing soil carbon contents correlate with a decline in agricultural productivity. The relationship between soil fertility and soil organic carbon was well known in the first half of the 19th century as the German agronomist Albrecht Thaer published his “Humus Theory”. Thaer’s approach, and quantitative assessment of agro-ecological and economic sustainability of farming systems was used with success during half a century, until 1849 when Sprengel and Liebig published on mineral nutrition of plants (13). From then on the “minimal nutrition theory” progressively abandoned recycling of nutrients from settlements to agricultural fields (14). 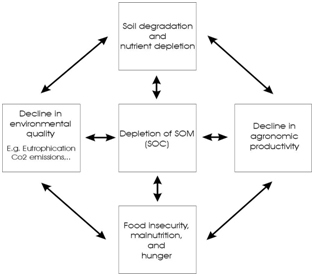 Mineral fertilization boosted crop production and replenished nutrient stocks but did not treat soil degradation accompanied by accelerated loss of carbon. The observed loss of soil organic carbon is associated with yield decreases, reduced nutrient cycling and reduced nutrient-use efficiency of applied fertilizer (3, 9, 11, 12). Throughout the world intensive agricultural land use often has resulted in soil physical and chemical degradation, erosion, and higher losses than input rates of nutrients and organic materials. In contrast, the intentional and unintentional deposition of nutrient-rich materials within human habitation sites and field areas has in many cases produced conditions of heightened fertility status. An anthropogeni-cally-enriched dark soil found throughout the lowland portion of the Amazon Basin and termed Terra Preta de Índio is one such example (16). These soils contain high concentrations of charcoal (17); signifi cantly more plant available nutrients than in the surrounding soils (18). 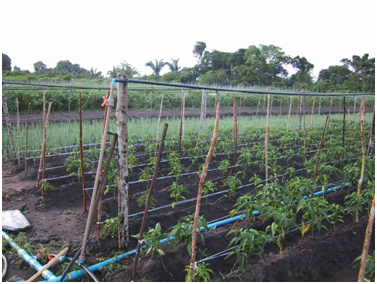 The existence of Terra Preta proves that infertile soils can be transformed into permanently fertile soils in spite of rates of weather-ing 100 times greater than those found in the mid-latitudes. Such a transformation cannot be achieved solely by replenishing the mineral nutrient supply (3). It is important to separate effects due to organic matter per se (maintenance and improvement of water infiltration, water holding capacity, structure stability, retention of nutrients, healthy soil biologi-cal activity) from those due to decomposition (19, source of nutrients). Carbon is an important indicator of soil quality, and has numerous direct and indirect impacts on it such as, improved structure and tilth, reduced erosion, increased plant-available water capacity, water purification, increased soil biodiversity, improved yields, and climate moderation. This is essential to sustain the quality and productivity of soils around the globe, particularly in the tropics where there is a greater proportion of nutrient poor soils with a greater susceptibility to carbon loss (Due to faster decomposition in a hot and humid climate).